( webmaster: Ruby is my mother's cousin ). row 1 2 3 Lily Robb . "Hi again. I am just over the moon with the class pictures Ruby entered in the Dalmarnock School Book. And I am even more excited that I am actually in one of them. This is the only picture I have of myself now at school. I was wondering if Ruby could take it and have it copied and mail it to me? ........ Please tell Ruby I Thank her so very much. I tried to copy it from the computer. but it only gave me part of it. I can remember some of the faces but not the names, put this down to Old Age, ha ha. The girl next to Isobel Hillson is Ann Hogg. Don't ask me how I remembered that name! I guess I just was not into boys yet at that tender age as I cannot remember a one. Shame! I just can't wait to show this to my children and my Sister Joan. I wonder if she could put names to any of them, I think her memory is a bit better than mine. Again I wait with baited breath to hear from you or Ruby." If anyone can make the connections, I would love to hear from you as this is driving me crazy. 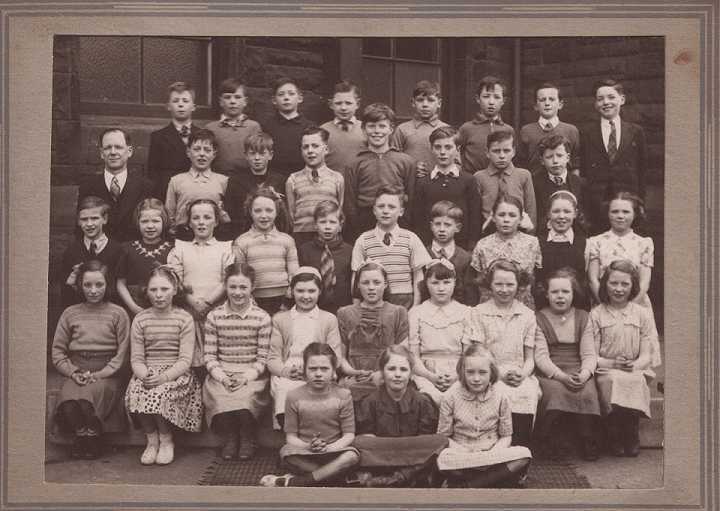 Hi Webmaister............the Dalmarnock School 1949 9yrs,tap row (4) is mah cousin John Hannigan, 'n 4th row (8) is Andy Robertson. Ah wiz pally wi' his older brithers in the 50/60s. Unfortunately Andy died at aboot age 25. Keep up the great work. Jackie Dougall.